European Travel Agents Association File Complaint Against Lufthansa Group in DCC Battle. ECTAA the umbrella organization for the European Travel Agencies on July 24th 2015 filed a legal complaint to the European Commission. In this direct complaint the ECTAA group is claiming that the Lufthansa action in imposing a 16 euro fee for each booking with its DCC – Distribution Cost Charge made via the GDS directly contravenes several European Commission statutes. A full copy of the press release about their complaint can be found here. Specifically ECTAA’s board charges that the DCC programme contravenes the European CRS Code of conduct. The full text of the regulation can be found on the European Commission Site . Following a detailed legal analysis of the Lufthansa announcement, ECTAA has decided to file a complaint with the European Commission Directorate-General for Mobility and Transport as Lufthansa’s action constitutes a breach of the EU Regulation N° 80/2009 on a Code of Conduct for GDSs. in particular in what concerns the provisions of the articles 10.4 and 10.5 of the Regulation. Indeed, if the Lufthansa’s Agent booking platform falls within the definition of a GDS as defined in article 2.4 of the Regulation, Lufthansa as a ‘parent carrier’ must comply with parent carrier’s obligations as specified in articles 10.4 and 10.5. “ECTAA and its Members are further pursuing legal investigations to see whether Lufthansa’s actions infringe European competition rules (Articles 101 and 102 of the EU Treaty). 4. A parent carrier shall neither directly nor indirectly discriminate in favour of its own CRS by linking the use of any specific CRS by a subscriber with the receipt of any commission or other incentive or disincentive for the sale of its transport products. 5. A parent carrier shall neither directly nor indirectly discriminate in favour of its own CRS by requiring the use of any specific CRS by a subscriber for sale or issue of tickets for any transport products provided either directly or indirectly by itself. 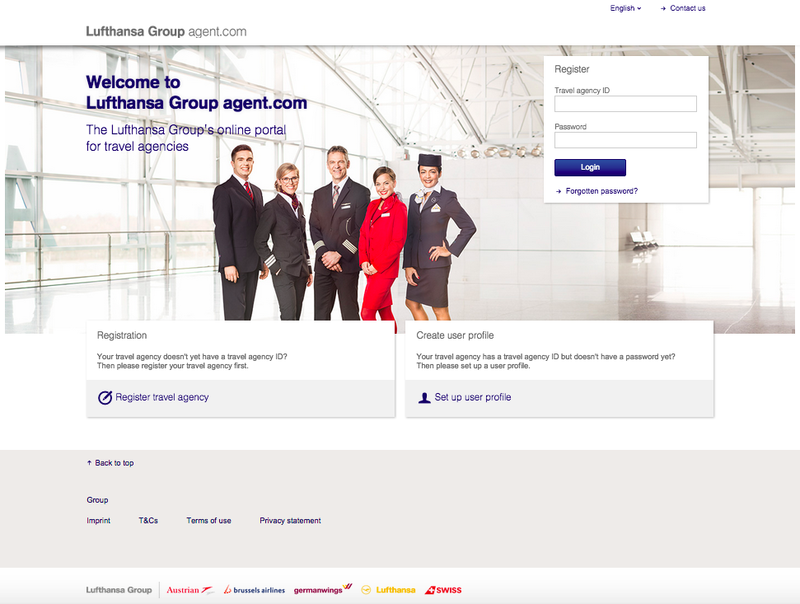 It would appear that ECTAA is trying to argue that the new airline platform is indeed a CRS as defined by the code and therefore there is discrimination going on vs the other CRS companies – namely Lufthansa Group Agent.com is favoured against the competing platforms of Sabre, Amadeus and Travelport. However on close examination of the CRS Code of conduct there is a clear exemption which would appear to invalidate the ECTAA claim. Specifically Article 5 we believe exempts Lufthansa’s direct channels as follows:. 5. This Article shall not apply to a CRS used by an air carrier, or rail-transport operator, or a group of air carriers, or of rail-transport operators, in its or their own office or offices and sales counters or on their own websites clearly identified as such. As we can see from the attached screen shot this would seem to confirm the view that the site is clearly identified as being branded by Lufthansa. With regard to ECTAA’s view that Lufthansa is in breach of the main competition law of the European Commission, the invocation of Articles 101 and 102 of TFEU. The complaint could also fall afoul of such European regulation itself. As has been seen from the recent hotel price fixing allegations against Sabre’s hotel system with rate parity clauses being essentially outlawed – any attempt to force rate, fare or fee parity would appear to be in conflict with 1. (a) above. This would tend to support Lufthansa’s stated view that it would be against the law if the airline was not being able to change rates by channel and type and also to charge different prices by different channels. This is going to be interesting. There is a certain sense of urgency since Lufthansa’s DCC charge goes into effect on September 1st 2015, for four members of the airline group’s legacy carriers – Lufthansa (LH), Swiss (LX), Austrian (OS) and Brussels (SN). My opinion is that Lufthansa is on solid ground with its process and decision. Further this movement has put a significant focus for the agency community who must now face the more urgent need to build deeper relationships with their providers. The opinions and analysis expressed here are of the author and the examination of the available information. I am at pains to state that I am not certified as a legal expert and all views and writings expressed here should not be regarded as formal legal opinion and therefore must not be relied on as such.